It is "distracting, frustrating and expensive" to have to recruit large numbers of nurses from overseas, the head of a leading NHS hospital says. Dr Keith McNeil, who runs Addenbrooke's Hospital in Cambridge, urged officials to "figure out" what resources were needed and improve UK recruitment. 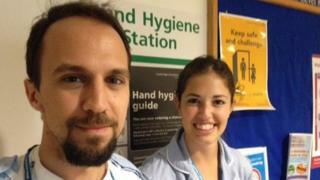 Around 7,500 nurses from countries such as Spain, Romania and Italy registered to work in the UK last year. Health Education England said national training places had increased. Figures from the Nursing and Midwifery Council (NMC) show the recruitment of overseas staff to the UK is growing. The number of nurses coming here from other parts of the EU has risen steadily during the past six years - now making up the vast majority of new overseas recruits - while the number of foreign nurses from beyond Europe has dropped. The trend has been driven partly by the financial crisis in countries such as Spain and Portugal - and because of extra demand for NHS nurses in the wake of the Mid Staffordshire scandal. The number of training places for nurses in England fell in 2011 and 2012. Cambridge University Hospitals NHS Foundation Trust has taken on 303 foreign nurses in the past year. Half were from the Philippines - with significant numbers from Italy, Spain and Portugal. Dr McNeil, the trust's chief executive, told BBC News: "Nurses are the backbone of the NHS. You can't run services effectively in an acute hospital like this without adequate numbers of trained nursing staff. "It's distracting, frustrating and expensive to do international recruitment. It would be nice not to have to do it... [and] to have a more targeted approach." He added: "We don't have enough home-grown nurses, but we know the demographics. The health service has to figure out what resources are needed for our activity. We need proper planning; I think the people at Health Education England are doing that now. "At least doing it now means avoiding having to do this in the years to come." Nursing experts fear that shortages could be fuelled in the coming years by retirement among the baby-boomer generation, and limits on the number of skilled workers from outside the EU who are allowed into the UK. Last month, NHS Employers issued guidance to trusts on how to plan successful international recruitment. Addenbrooke's believes it costs £3,000 to recruit each nurse from elsewhere in the EU. New arrivals are given their first month's accommodation and also £400, so long as they stay for 18 months. They are also sent on a language course if they need to boost their conversational skills in English - as well as being given 10 weeks of support in the hospital to help their technical and clinical language. The Cambridge hospital believes the big recruitment drive is paying off, because it is now using fewer temporary staff from agencies. But there have been concerns that some overseas nurses leave the UK after just a short period here. Commenting on the need for more UK training, the head of the Royal College of Nursing, Dr Peter Carter, said: "Last year there were 57,000 applicants for 20,000 nurse training posts. "Isn't that a matter of huge regret that you've got people in the four countries of the UK who want to train as nurses. They're being turned away, while we're going off and raiding the often impoverished workforce of other countries." He added: "It's hugely regrettable and the UK is not exactly covering itself in glory in this." The organisation now in charge of nurse training, Health Education England, says it has increased places by 14% in two years. A spokeswoman said: "The number of nurses in the NHS is a matter of public and political comment, and HEE has responded to those concerns. "HEE increased adult nurse commissions significantly in its first year and increased them again the following year. "And we launched the Return to Practice campaign which has already started 1,300 experienced nurses on their journey back into the NHS. [Some] 160 of these have successfully completed training and are now employed."